COMING TO PORTLAND! UNA BULLA! 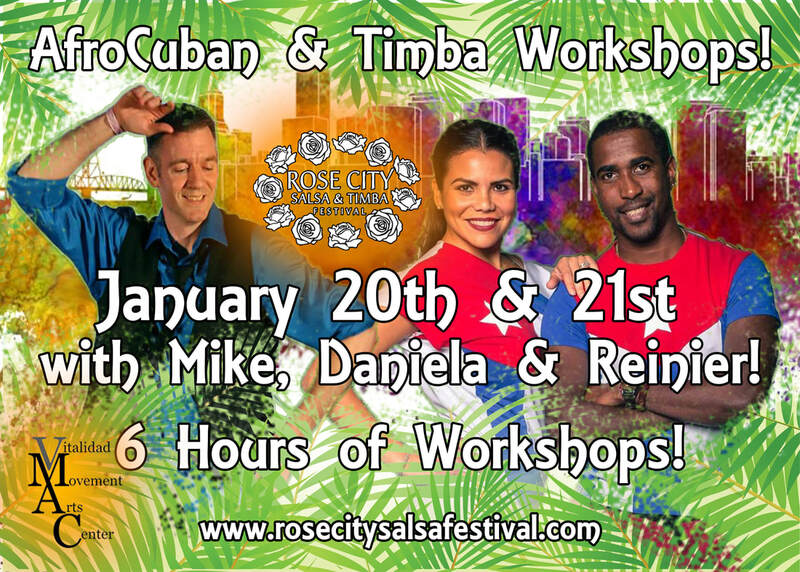 Rose City is extremely honored and excited to announce that world renown masters in the arts of AfroCuban & Rueda are coming to Portland for a fantastic workshop opportunity on January 20th & 21st! Please help us welcome Daniela Gallardo de Valdes, Reinier Valdes & Mike Eskeldson . They will be teaching six hours of intermediate + level classes. . . . . . . . . SATURDAY, JANUARY 20TH . . . . . . . . . .
. . . . . . . . SUNDAY, JANUARY 21st . . . . . . . . . .
Reinier Valdes first started dancing to the Afro Cuban rhythms at the young age of 13 and was immediately discovered by a professional Afro Cuban dance team which recruited his talent and showcased him all over Cuba. At 18 he graduated from the Cuban school of dance as a dance instructor specializing in Popular Dances, such as Cuban Salsa, Son, Cha cha cha , Mambo and Rumba. In February of 2009 Reinier relocated to Brazil where he continued his work as a dancer, performer, and choreographer. He started his own performance group in 2010 calls Influencia Latina and started touring and performing around Brazil. Reinier now lives in Seattle, WA where he funded La Clave Cubana a Cuban dance troupe and dance academy through which he continues to share his talent and passion for the Afro Cuban rhythms through dance classes, workshops, and performances. Daniela Gallardo love for music and dancing started at a young age leading her to be one of the principal dancers at the music festivals in her school; She was invited to create her first choreography at the age of age 15! Daniela discovered Casino in 2011 - soon after she was invited to join a team in Mexico where she developed even more. As soon as she moved to Seattle, Daniela participated in various auditioning sessions until she was accepted in “La Clave Cubana” Daniela is now the Co-Director of “La Clave Cubana” and teaches alongside Reinier Valdes at their dance academy and at Cuban Dance Congresses all over the US sharing her passion and talent everywhere she goes. Mike Eskeldson is the director of the famous Rumbanana. He has studied, danced, performed, and taught Cuban Salsa for more than a decade. His mission is to share his addiction of Cuban music and dance and to boldly seek out new information, resources, and music.